We're off out to terrorise some old people. 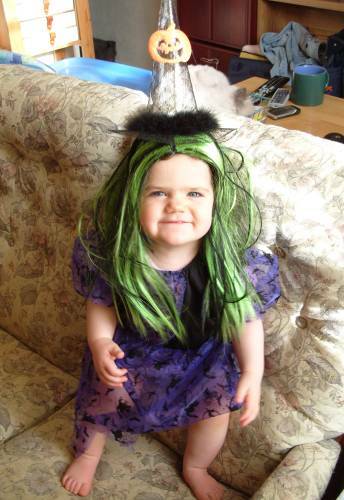 At this rate she'll be able to go out trick or treating on her own. Apparently Ben Elton and Shane Richie were in the audience, so there were at least four of them there. Which I think is an improvement on the last time Sis saw the Nolans. Lisa described it to me as “a bit like a Chippendales show”. And frankly she should know. On the downside, Sis expressed her slight disappointment that the Nolans barely sang any Nolans songs, but as I pointed out to her, they’ve only really got the one, and they have to save that for the encore. The rest of the show was apparently “like a karaoke night”. Albeit one which cost forty quid a ticket. But from the sound of it, Coleen’s ‘I Will Survive’ is second only to Gloria Gaynor’s. The support act for the evening were Coleen Nolan’s two sons, who I think are a bit like John & Edward from the X Factor. Unfortunately Big Sis and Lisa missed most of their set after they decided to head off for ice cream instead. Apparently Shane & Jake can’t compete with Ben & Jerry. I don’t know who looks madder – Big Sis, or me for being up at eleven-thirty on a work night. Big Sis is back! Hurrah! If you're wondering what she's holding in her hand, it's a pre-paid Brighton bus ticket. The open-mouthed expression is because she still couldn't believe we expected her to use public transport. As for me, I'm putting a brave face on a bad headache. I saw a grand total of twenty-eight patients yesterday, and I think one of them gave me a lot more than just a firm handshake and a copy of their appointment letter. I'm sure I'm coming down with some kind of flu-type nastiness. Personally I blame the woman who wished me Happy Christmas as she walked out of the door. But the good news is that I saw my urology consultant this morning, and after six months under his care, he's decided that I'm cured and is planning to discharge me. On the downside, he wants me to continue taking Tamsulosin every day for the rest of my life. Which seemed a bit excessive until he told me I've only got six months to live. Just kidding. He actually informed me that I definitely (his word, not mine, and he should know - he's taken six months to come to this conclusion) have Chronic Bacterial Prostatitis, and the only thing likely to stop it flaring up repeatedly until I'm well into my nineties, is for me to take an alpha blocker a day for the next half a century. 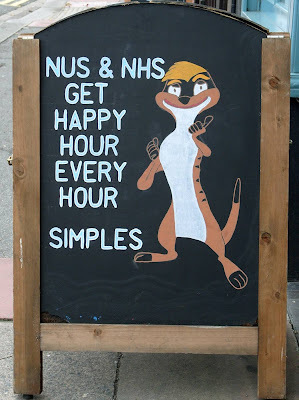 I agreed, whilst mentally trying to work out how much that's going to cost me in prescription charges. But having struggled through the day with a headache, I was buoyed by the arrival of Big Sis at 6:45pm. And her departure half an hour later. She's been left to her own Devizes in Wiltshire for the past couple of months, but she paid a flying visit to Brighton this evening to accompany Lisa to a Nolans concert. I know, I can't believe there are two people who want to go either. But there are. And they're both related to me. I don't know what I've done to deserve this. So Sis breezed in forty-five minutes late, asked if she could borrow some hair straighteners, forced me to carry a microwave to her car, then gave me her American Express card and told me to order a wedding present online for two of her friends. Having browsed the John Lewis gift list, I eventually went with a paper shredder for £43.50. It'll come in useful if they ever get divorced. That done, Bis Sis asked Lisa how they were getting to the Brighton Centre. I'm not saying she was appalled by the answer, but her expression was the main reason I asked to take the photo above. She was obviously expecting a limo. And frankly, with the amount of money the Nolans charged me for tickets, so was I. At the very least, they should get a lift home from Coleen. I blame her Grandma for that. If it wasn't for the fact that our sofa already has vomit stains, cat scratches, legs held on with glue, and a burn mark where Lisa put down the iron, I'd be quite annoyed. But the girl's progress over the past few months has been remarkable. 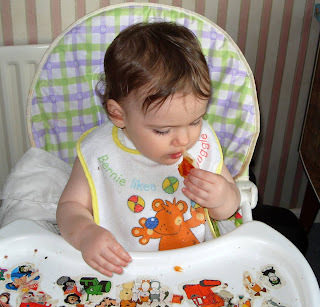 As Lisa said to me quite seriously the other day, "Amelie's now at the point where she can eat human food". I think I'll put away the cat biscuits. You know what it's like. You crawl out of bed at 7am on a Tuesday morning feeling dog-tired after a bad night's sleep, and by 2pm that afternoon you're single-handedly training the international doctors of tomorrow. It makes me wish I'd bothered to shave this morning. I was doing a clinic in the hospital's diabetes centre this afternoon, and the consultants there are currently playing host to a group of medical students who are spending time in various departments as part of their doctorly training. 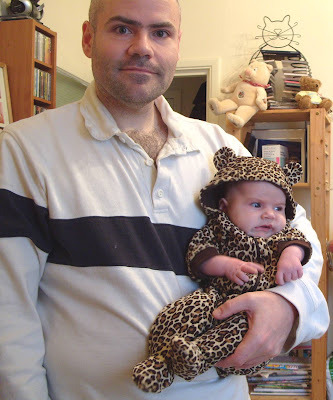 Most of them look about three years older than Amelie, and are presumably just as tiring to look after, because half an hour into my clinic I was asked to take one of them off the consultant's hands and let her sit in on a few of my patients. She turned out to be an American girl, so what she's doing over here, I have no idea. I expect it's all part of Obama's healthcare reforms. Although the way they've been slagging off the NHS over there, I presume she's not a Republican. She was actually a very nice young lady, and as a doctor in training, she probably knows more than I do about virtually every part of the body. But not the retinas. Oh no. I spent forty-five minutes answering the girl's questions and showing her photos (of eyes, not Amelie), and it was all very enjoyable. There's something deeply satisfying about being looked up to by someone with five A*s at A-level. With one international exchange student well and truly educated, I was promptly given another. 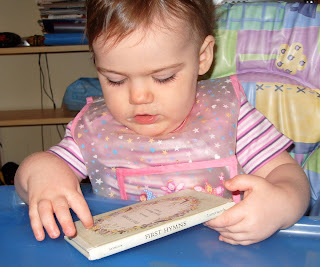 This one was British, and only looked about two years older than Amelie. It was like spending half an hour with Doogie Howser MD. I was going to say that to her, before realising that she probably hadn't been born when that show was on TV. At which point I shed a silent tear and wondered where my life's gone. Anyhoo, the best part of it all was that I had to sign their official training logbooks to say that they'd sat in on one of my clinics and I'd instructed them in the dark arts of retinopathy. So when they sit their finals in a few years time, and stand on the brink of being qualified doctors, they'll be able to look back on those records and see that they learnt everything they know about retinas from me. And when they fail those exams, they'll know who to blame. That's me in the foyer. The booze on the left is extracurricular. Fortunately, to pass the entrance exam yesterday afternoon, all you needed was a wedding invitation. 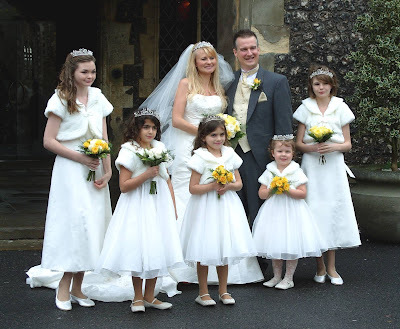 Our good friend Lorraine moved house on Monday with her three cats and two babies, so what better time to get married than the following Saturday. She booked Brighton College mainly so that Lisa and I wouldn't have to walk more than a hundred yards to get there. She knows what we're like for being late. It's as if David Cameron has married Barbie. We also thought the littlest bridesmaid was a lot like Amelie. Only much better behaved. 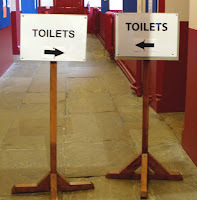 Anyhoo, despite the confusing signs, we found our way around Brighton College quite well yesterday. 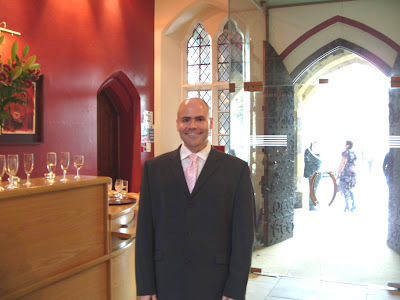 The wedding ceremony was held in the chapel, which featured the kind of numbingly hard pews which make you want to stand up and praise the Lord at all times. Lorraine had eschewed the traditional organist in favour of a string quartet made up of retired members of the London Philharmonic Orchestra, which I thought was a nice touch. I've never sung a hymn accompanied by violins before. As the congregation settled down to a nervous hush, Lisa realised she had her mobile phone on, which is ironic, as she never normally does. But fortunately she turned it off before the groom's sister (who's apparently been on X-Factor) took to the lectern to perform an a cappella version of 'The First Time Ever I Saw Your Face'. Which according to the best man's speech, was at a barbecue. Personally I thought she was very good. Despite what Simon Cowell may have said. With the vows made, and the couple spliced, we made our way outside for the photos. And then inside shortly afterwards when we realised how cold it was. 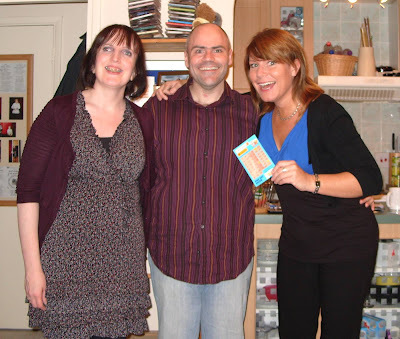 It gave Lisa and I the chance to catch up with the winner of the award for 'Person Who Travelled Furthest To Be Here'. That's her on the left, pictured with the woman who lives within spitting distance. 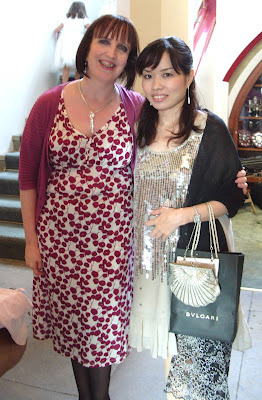 I actually mentioned that young lady on this blog three and a half years ago (third paragraph from the bottom), and despite having moved back to Tokyo since then, she'd flown for seventeen hours on a plane just to attend Lorraine's wedding. Which makes me feel slightly guilty that she got there before us. Anyhoo, we had plenty of time to mingle, because there was a gap of more than two hours between the ceremony and the sight of any food. I was so hungry, I could barely shake hands with drunk people. 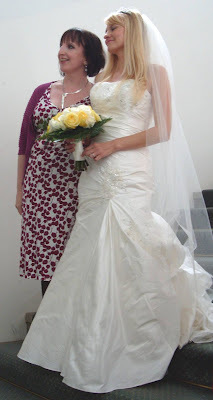 But fortunately I managed to summon the strength to take this photo of Lisa with the blushing bride. Admittedly, Lisa's looking the wrong way, and Lorraine's not looking at all, but you can't have everything. At least Lisa's not falling down the stairs. Shortly afterwards, we finally took our seats for a surprisingly good meal of pork, duck and white chocolate (not all in the same course), which was served to us by people in Brighton College aprons. It was a bit like a Hogwarts banquet, only more magical. I particularly enjoyed the anecdote shared by a chap on our table, who recounted to us the story of Lorraine's 21st birthday do, a fancy-dress party held at a venue owned by a Jewish couple. Which wouldn't be significant were it not for the fact that someone turned up dressed as Hitler. As it happens, Lisa was at that party too. She went as Popeye. And trust me, if photos exist, I will find them. That Alison sounds like a nightmare too. 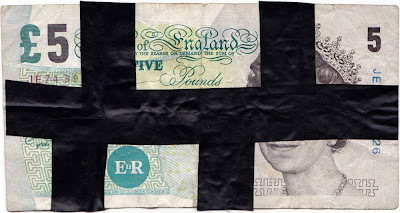 That's a torn and restored five pound note, courtesy of Pete Firman. As he said to me onstage last night, shortly before asking the audience to give me a round of applause, "If you show that to your bank manager in the morning, he'll tell you what you can do with it". 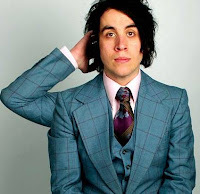 Anyhoo, despite costing me slightly more than expected, The Pete Firman Magic Show at the Pavilion Theatre last night was very good. The evening started well when Lisa turned to me at the bus stop and admitted that she'd never heard of Pete Firman, never seen Monkey Magic, and would much rather have stayed in and watched EastEnders. Fortunately I have the ability to ignore everything she says (particularly when it involves EastEnders), so I didn't let it dampen my spirits. And besides, I was keeping my fingers crossed for a bit of audience participation. I knew she'd perk up once she was being sawn in half. Having arrived at the theatre, Lisa surprised me by choosing seats in the second row. Bearing in mind that on the three occasions we've been to see Derren Brown, she's hit the deck and hidden under her chair every time he's asked for a volunteer, I felt it was a bold move. So we took our seats front and centre, next to a couple who were eating a selection of sushi. Which says just about everything you need to know about Brighton. Thirty seconds before the metaphorical curtain went up (this was the Pavilion Theatre, so there wasn't one), my Mum texted me with the good news that Amelie had settled into her weekend retreat perfectly, and made herself at home. Well, what she actually said was "Do you have a loft we can put our valuables in? ", but it amounts to the same thing. The show began at 7:30pm, but it was a full ten minutes before Lisa was singled out and invited to take part. And I was right: it did perk her up. I could hear her heart pounding a mile off. It basically involved a trick in which Pete would magically seperate two handkerchiefs which had been tied together. He needed someone to verify that the knot was both genuine and tight, and having scanned the first few rows of the audience, he spotted Lisa, and immediately realised that she'd be perfect for the job. After all, if you're going to pull the wool over someone's eyes, choose the woman who couldn't tie a knot to save her life. Lisa was forced to announce her name to the audience, and thoroughly examine the knot. I asked her afterwards if it really had been genuine, and she told me that the whole experience was just a blur of panic and stress, so she has no idea. It's amazing how the human mind copes with trauma. Fortunately, Lisa wasn't the only one who got to enjoy a bit of local fame last night. Barely halfway through the show, Pete Firman suddenly pointed at me, asked for my name, and requested a five pound note from me, adding "With the money you've saved on those clothes, Phil, I'm sure you've got one". Luckily for him, I did. So I handed it over. And he tore it up. It was an interesting moment. As Pete said to me over the sound of ripping, "You've paid good money for this, Phil, so I hope you're enjoying it". The thing is, I think he really did tear it up. If he didn't, it was a damn good trick. I suspect the fiver I got back, covered in tape, was one he'd prepared earlier in true Blue Peter fashion. Anyhoo, Lisa and I might have been the stars of the show (I got two (count them) rounds of applause), but I have to say that Pete was very good too. He did some of the most traditional magic ever invented (the linking rings, the egg bag) but made it funny and interesting, and even Lisa, who'd started off with her mind back in Albert Square, admitted that she'd thoroughly enjoyed the show. All in all, it was money well spent. Apart from the fiver. First I spent time with Germans. Then I washed the hair of Hitler. Now I've met someone who's dressed as a Nazi and machine-gunned Robert Mitchum. Thank God it's Friday. If this carries on for much longer, I'll be appearing on Question Time. Anyhoo, I love the conversations I have with my patients. I ask them about their diabetic control and blood pressure, and they tell me that they've appeared as an extra in The Longest Day with John Wayne and Henry Fonda. I'm probably breaching patient confidentiality by telling you this, but the Nazi with the machine gun who mows them down at the top of the hill in Normandy is now a diabetic living somewhere in Sussex. I've got a photo of the man, but you probably wouldn't recognise him from his retinas. Movie magic aside, Lisa and I have performed our own vanishing act this afternoon. We've made Amelie disappear. We've successfully packed her off to her grandparents' for a couple of days to enable us to attend the wedding of our good friend (and cat-fattener) Lorraine tomorrow. 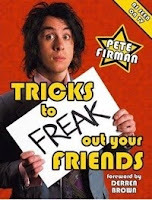 So in an effort to make the most of some precious child-free time, we're clambering straight over the living room wreckage that Amelie's left behind, and heading out of the front door tonight to see master magician, Pete Firman. He's playing the Pavilion Theatre in Brighton this evening. It's almost a year and a half since Lisa and Amelie appeared onstage there, so it'll be nice to go back. Back in June of this year, shortly after looking myself in the eye and becoming a retinal screener, I took a break from the intraocular pressure of work and rewarded myself for all that eye strain by going online and ordering two tickets to see Taylor Swift at Wembley Arena on November 23rd. She's the teenager on the left. Kids these days don't know they're born. And sure enough, when I did my GCSEs in the summer of 1989, she hadn't been. But apparently she's already earned eighteen million dollars so far this year. Which is at least seventeen million more than I have. It makes me wonder what I've been doing with my life. Ticketmaster don't always send out your tickets when you book them - in fact they say you might only get them 7-10 days before the concert, but in the past I've always received them much sooner. However, I was on the Ticketmaster site on Sunday night, booking two tickets for The Nolans at the Brighton Centre (DON'T ASK), when I noticed that it said my Taylor Swift tickets had already been dispatched. It suddenly occurred to me that I couldn't remember ever receiving them. I assumed I had - after all, they usually arrive within a few weeks of ordering, but I've been a bit blinkered by eyes in the past four months, so I wasn't sure. As a result, I've spent the last three evenings taking over the night shift from Amelie, and continuing her good work by turning the flat upside down in an effort to find them. Needless to say I failed. So at 9pm last night I finally e-mailed Ticketmaster, told them my tickets had been lost in the post, and asked if they'd cancel them and issue me with new ones. At midday today, my original tickets arrived in the post. I wait four months for them to come, and they arrive on the first day of a postal strike. What are the odds? If there's one thing I've always said about the Germans, it's that they're excellent judges of character. One of my patients today was an 87-year-old lady from Berlin who had poor vision, poor mobility, and the ability to hear only those words which were shouted twelve inches from her ears. Fortunately I didn't need to try, as she spoke no English. But as luck would have it, she brought her son along to do all the talking, while she got on with the important business of smiling at everything I said. As the proud owner of a GCSE in German, I can naturally say Guten Tag, Danke Schön, and virtually nothing else, but I didn't need to understand more than the basics to know that between the two of them, they were giving me the kind of respect usually reserved for Angela Merkel, Gerhard Schröder or Boris Becker. Every time I gave an instruction or asked a question, the son would translate it for me, adding the word "Doktor", which I believe is German for 'dedicated healthcare professional'. Similarly, the lady would reply with the words "Erklären Sie dem Doktor...". Frankly after ten minutes of conversation, the three of us were firm friends, and I felt like I'd spent five years at medical school. 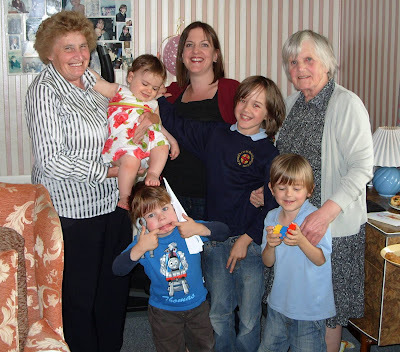 I was tempted to tell them that my daughter has the hair of Hitler and is about to invade Poland on a plastic turtle, in the hope that they might invite me back to their place for some Black Forest Gateaux, but in the end I decided to keep quite about my Nazi connections. So I just mentioned that I like sausages, and left it at that. You know what they say about 92-year-old women in wheelchairs. You wait ages for one, and then two turn up together. I had consecutive patients today who arrived within five minutes of each other from two different nursing homes on opposite sides of Brighton, both wheelchair bound, and born within a few months of each other in 1917. Their parents obviously made the most of some home leave from the trenches. At that age, of course, you're fully entitled to be rude about your carer, so during the liminal ten minutes between eye drops and photos, one of the ladies kindly pointed out her nurse to me and said "She's new. She knows nothing". I politely replied that I'm sure that can't be true, so she helpfully added "And she's agency, so she knows even less". I wouldn't mind, but the girl was standing two feet away. Personally I'd want to keep on the right side of the only person capable of wheeling me home. It's a lesson Amelie would do well to learn before she starts moaning at me in the middle of Aldi. All she needs is a plastic turtle on her head and she can pass for a member of the Village People. 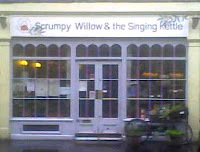 Britain's Got Talent, here we come. 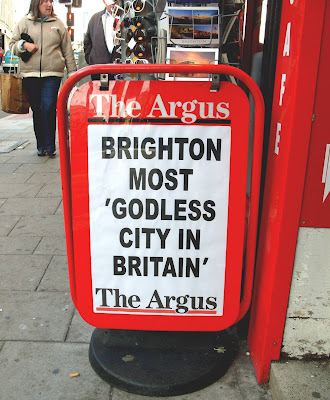 Brighton might be the most Godless city in Britain, but I'm sure someone up there is playing a joke on me. My mobile rang about twenty minutes ago (which is unusual in itself - I'm quite an unpopular person), so I answered it, and without so much as a hello, a woman's voice said "Have you still got the cat?". For a moment I thought I was involved in some kind of hostage negotiation, so I played it dumb and said "The cat?". She replied "Yes, have you still got it?". I was slightly thrown, but back in February when Chloe was conquering the world, it was quite common for complete strangers to phone me on my mobile and propose photo shoots, film premieres and free tins of cat food in return for dubious services rendered. So I assumed The Argus had given out my number again. I replied "Do you mean Chloe?". She said "Is that the white cat?". I said "Yes". She said "Have you still got it?". To be honest, we were getting nowhere fast, so I decided to cut straight through the confusion and ask "Who is it speaking?". She ignored me, and said "It's about the free white cat. Have you still got it?" The word 'free' bothered me. Chloe has never worked for nothing. So I decided to ignore her this time, and instead asked "Where did you get my number?". She replied "Gumtree". I promptly told her she'd got the wrong person. So she put the phone down without saying goodbye. I found the advert on Gumtree after five minutes of searching. 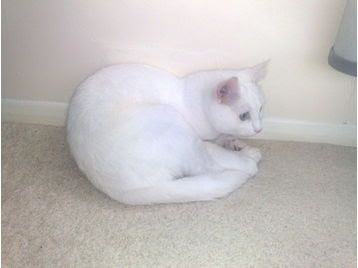 It's a white cat which is one quarter Persian, lives in London, and is free to "a warm home". I presume his current owner can't pay the heating bills. But most bizarre of all, despite the billions of possible combinations in an eleven digit mobile, the phone number in the advert is just one digit different to my own. Godless, my foot. Apparently we haven't got a prayer. Just look at that couple of heathens in the background, clutching their material possessions close to their chests and making straight for the rack of sunglasses to protect their eyes from the light of the world. They're committing at least three of the deadly sins just by walking down North Street. But the good news is that Jonah's on his way to save us all from eternal darkness. He'll have a whale of a time in Brighton. Personally I'm more of an eater than a drinker, so I'd prefer a happy hour at Pizza Hut, but I took the photo for Amelie. She loves that meerkat commercial. It's the only thing capable of stopping her in her tracks when she's climbing over the back of the sofa. Frankly I'm surprised her first word wasn't 'Simples'. And on the subject of Amelie's feral behaviour, she's become very crafty in the past twenty-four hours. Her current goal in life is to get herself onto the sofa so that she can climb over the back and grab the phone, the pens, the calculator, and basically anything she can reach from the table. 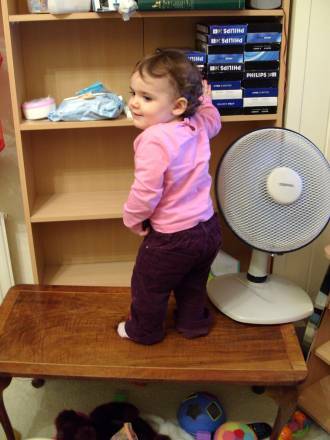 Unfortunately, despite being the tallest one-year-old in Britain, she can't make it onto the sofa without assistance. So she's started resorting to trickery. She'll now make her way over to her toybox, pick up her favourite 'Head, Shoulders, Knees and Toes' book, and bring it over to me on the sofa, where she holds it up, puts on her most angelic expression, and politely asks me to read it to her (in a non-verbal kind of a way). Which is all very sweet. Unfortunately, the moment I pick her up, open the book and start singing, she dives off my knee and is halfway up the back of the sofa, legs dangling, playing cat and mouse with Chloe and my computer equipment, all before I've reached the first chorus of "knees and toes". Frankly she's more of a fibber than Lisa. But subterfuge aside, I've been buoyed by a message we received yesterday evening from Lisa's sister, asking if we have any objections to Nephew Number Three (he's the loopy one) putting a photo of me, Lisa and Amelie up on the wall of his nursery school. Apparently they're doing some kind of display of 'important people'. Personally I was chuffed to bits. 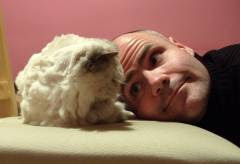 Until I found out that he really only wanted a photo of Amelie. Lisa and I just happen to be in the background. "In My Daughter and I was the narrator supposed to be the mother or the father humself?" Obviously answering that question would effectively be helping a student to cheat with his homework. So I think I'll just send it back with the spelling corrected. I've spent today with cliff and the shadows. 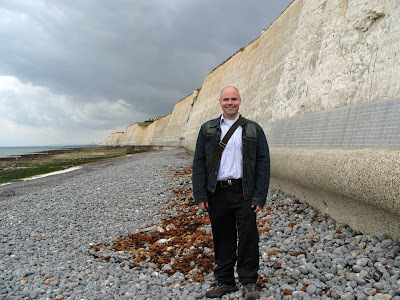 That's me on Peacehaven seafront. It's like the white cliffs of Dover for people on income support. The shadows were back in my consulting room at the Meridian Surgery. It gets about half an hour of sun a day, and is generally colder than Christmas in Lapland. I took my milk out of the fridge to keep it cool. 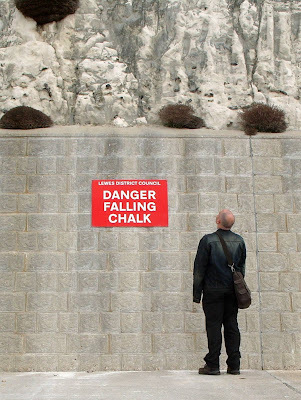 The last time I was hit by flying chalk was in a maths lesson at school. That'll teach me to chat at the back of the class. Anyhoo, between chalk and cheese sandwiches, I had a very pleasant lunchtime walk, and a good working day with twenty-five of the nicest patients you could ever wish to meet. It must be the sea air which brings out the best in people. Having stopped and read a tourist information sign on the clifftop, I also discovered why the Meridian Surgery is so called. Apparently it's because the Prime Meridian runs straight down from the Royal Observatory in Greenwich to the Co-op car park in Peacehaven, bisecting the surgery in two. I'm the only man ever to do retinal screening in two hemispheres at once. But having finished my war on Peacehaven's retinopathy levels, I returned home to news of Amelie's close encounter with the health visitor. Apparently the woman was very impressed with Amelie's alertness and verbal skills (she's hyperactive and noisy), but it looks as though we're raising a monster. Not only is she in the top 8% by weight for girls of her age (I've already put her name down for fat camp) but she's also in the top 5% by height. So she'll make one heck of a netball player, but she might not be able to bend over to pick up the ball. We're still studying that CCTV footage in an attempt to identify the person responsible for tipping that bucket of washing all over the floor. Now that Amelie's reached the grand old age of one, she's getting a home inspection from the health visitor tomorrow afternoon. I think it's primarily to check that we're looking after her, and not standing back while she grabs bottles of bleach from the bathroom. Which is why the disguise is such a good idea. I'd like to see that evidence stand up in court. Lisa's hoovered and dusted, and we gave Amelie a bath an hour ago. 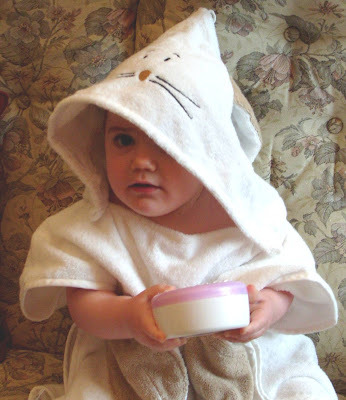 That was shortly before she dressed up as a rabbit and stuck her hand down the toilet. But fortunately germs no longer hold any fear for me. I was given an alcohol miniature at work today, and it's done wonders for my self-confidence. No, really. It's actually a small bottle of sanitising hand gel which clips to my belt for use in medical emergencies. Or when an unsavoury patient insists on shaking my hand. I might attach it to Amelie's changing mat. On the downside, now that we've cleaned Am's face, the bruise above her eye where she headbutted my Dad's music stand on Saturday seems a lot more noticeable. And when you combine that with her morbid obesity, and the fact that Lisa's cut off the circulation to her feet by forcing them into shoes which are patently too small, I think we could be less than twenty-four hours from foster care. At least that's what we're hoping. I saved somebody's sight today. No, really. Halfway through my clinic this morning, I spotted a lot more than just a twinkle in the eye of a young female patient of mine. She was only in her thirties, with good vision, and at first glance her retinas looked fairly innocuous. But upon closer inspection I spotted something I was concerned about, and the more I looked, the more I felt it was serious. As a trainee, I'm not yet allowed to grade retinal photos on my own, so I looked up the rota to see which of my colleagues were in the office today, and promptly e-mailed them with the details. Ten minutes later they'd looked at the photos I'd taken; within twenty they'd agreed with my diagnosis, and half an hour after seeing her, the lady was being urgently referred to the Sussex Eye Hospital. If I hadn't spotted what I did, her photos would have sat in the grading queue for up to four weeks. By which time she could have been blind. So even if I do nothing else in my career (which is a distinct possibility), I've made a life-changing difference to someone. I should probably ask for a pay rise. Or a free case of Tamiflu. Mind you, I don't think she's the only girl in their lives. There's a photo of Dolly Parton in the background. Anyhoo, we spent yesterday afternoon with Amelie's adopted uncles, Stefan and Andrew. If you're wondering why you've never heard of them before, it's because I used to refer to them as S & A. Fortunately I've now worked out how to spell their names. Saturday was spent with my parents (Mr & Mrs Gardner), who kindly agreed to accept more evacuees from my living room shelves in an attempt to save them from Amelie's bombing campaigns. Their loft is now so full of my stuff, there's barely any room for the woodworm. The most marked difference between the two days was in the catering. 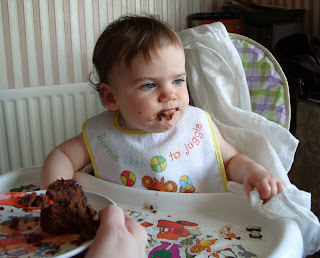 My Mum served me low calorie ready meals, while Andrew fed me cake. I was going to work out how many Weight Watchers points were in the chocolate cream icing, but Lisa's calculator won't accept numbers that big. Anyhoo, the good thing about Stefan and Andrew is that they're like a cross between Uncles and Sugar Daddies. Not only will they play with Amelie for hours on end while we nap on the sofa, but they're always buying her stuff. Admittedly most of it comes from Poundland, but that's beside the point. Where else can you get a plastic flower which ignites in a ball of flames before your very eyes, and then unfurls into a pretty flower with a candle on each petal, whilst playing the muzak version of Happy Birthday? It was a sight to behold. And well worth any lung damage we suffered by breathing in the toxic fumes from the unregulated Chinese factory which made it. As if that wasn't enough, Amelie is now well and truly kitted out for Halloween. She may have outgrown her glitzy witch outfit, but thanks to some shrewd shopping in the pound shops of Eastbourne, she now has the same costume in a bigger size, plus a pointy hat, a green wig and a broom that's taller than she is. The broom is a particular bargain, as she can use it all year round. Stefan kindly offered to model the wig, which resulted in Amelie bursting into tears the moment he put it on. Either it was very scary, or she was upset that he'd worn it without her permission. On top of all that, Amelie received a coat from H & M which is so nice, I feel like having three more kids just to make use of it. I'll run that idea past Lisa later. And then there was the cuddly dog in the furry kennel. Frankly we came away from their flat looking like we'd been on the Generation Game. If we carry on like this, my parents are going to need a second loft. There's a fine line between bonny bunny and Ku Klux Klan. 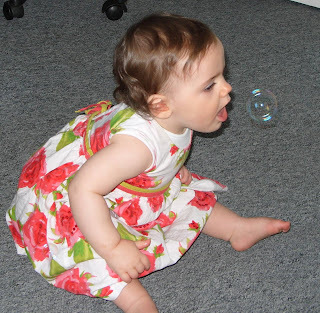 On September 30th, our good friend Linda read about Amelie taking her first three steps, and said "Wait until she can order pizzas on your credit card!" She even grabs a pen to write down her order. We had the last laugh though: Pizza Hut don't open until midday. We've actually received two of those in the space of two days. The one above came yesterday (the 8th), but my postman has no idea what day of the week it is. He put it through my letterbox together with an envelope clearly addressed to "Rear Basement Flat". Frankly the only strike he should be contemplating is one to the back of the head. And I'd gladly cross a picket line to administer it. 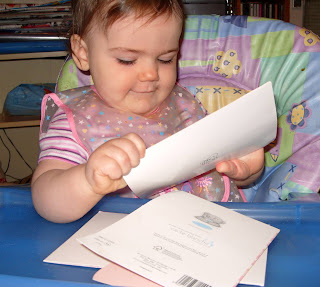 Today's item was a late birthday card from one of these people, but having paid the administration charge online for yesterday's item, I'm still awaiting redelivery to find out what it is and who it's from. It had better be worth more than £1.17, otherwise I'm seriously out of pocket. I'll be deducting it from Amelie's trust fund. But on the subject of babies, I have major maternity news from the Royal Sussex County Hospital. It's a well known fact around these parts that I'm the only person in the entire Brighton & Sussex University Hospitals NHS Trust who reads the Chief Executive's Friday Message every week. I can't tell you how many odd looks I get on a Friday afternoon when I open that e-mail. Admittedly it's not easy to concentrate amidst the sound of two thousand people simultaneously clicking the delete button, but personally I like to see what the man's got to say. At the beginning of this week we started offering the best practice antenatal screening 'combined' test for Down’s syndrome at the County and PRH. This involves offering pregnant women a blood test and an ultrasound scan the combined results of which show how likely it is that the baby will have Down’s syndrome. 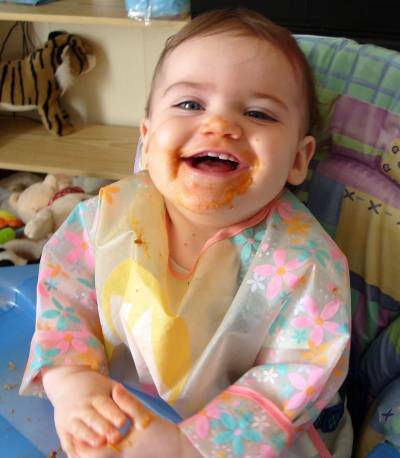 If the risk is shown to be high, further tests can then be arranged to help confirm whether the baby has the condition. Pregnancy is an exciting time but it is also an anxious time with a lot to think about and decide in a relatively short period of time. Prior to this week, pregnant women from Brighton and Hove needed to travel to King’s College Hospital in London for the combined screening test and women from Mid Sussex could have the scan at PRH but not the blood test. The option to have the combined test locally will be easier and better for families." I have to say, that is fantastic news. In March of last year, Lisa did indeed have to travel up to King's College Hospital in London for that nuchal scan, and coming only a week after I started my new job (and met the Chief Executive), I didn't like to ask for the day off. So she had to do it alone. Well, alone apart from the skinflint in the photo above, who met her in London and escorted her to the hospital. She'd never have found it otherwise. So the announcement that the pregnant women of Brighton no longer have to get on a train in the first trimester is actually quite a major one. I did a search on Google for 'Royal Sussex County Hospital nuchal scan' to see if the press have picked up on the news yet, but sadly it just took me to AmelieGardner.com. Which makes me wish I'd actually finished that website. I abandoned the project a year ago when I realised my blog was becoming Amelie's homepage, and she had no need for the gift of second site. But talking of the poster child of the NHS, Amelie's not the only one getting her face into official health service literature. Yesterday my colleagues and I received a positive report from the national body which inspects retinal screening programmes, so to celebrate, we all abandoned the office for five minutes and went out onto the grass with a medical photographer to have our picture taken. We're hoping to be in the next issue of Talkback, the Trust magazine. 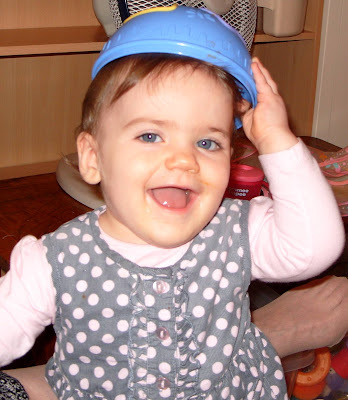 Amelie might be a poster child, but I'm on the verge of becoming a centrefold. I've had a day and a half in East Grinstead today. In addition to driving for more than two hours through the kind of rising water levels rarely seen outside Western Samoa, I've met a variety of interesting people, most of whom wanted to complain about things which had nothing to do with me. Two of them weren't even my patients. And one of them chased me down a corridor just to register her grievance. I wouldn't mind, but she was eighty-eight and I couldn't outrun her. But aside from acting like the East Grinstead branch of ACAS all day, I've met a lady who has to wear a leg brace after she trod on a three-pin plug in her bare feet, an octogenarian American from Washington state who's just moved to West Sussex (go figure), and a man who told me he's going into hospital on October 29th for a major operation on his knee. I replied "So no trick-or-treating for you this year then!". He didn't smile. I felt slightly awkward. But the highlight of my day was when I bid farewell to one of my patients and she walked out of the door with the cheerful words "Have a good Christmas!". I might do my next clinic in a Santa hat. She'll be on top of the bookcase by this time tomorrow. I've started a Weight Watchers diet today, so it's a miracle I've got the energy to write this. When I suddenly felt dizzy halfway through my clinic this morning, I didn't know if it was because I'd forced myself into work with the lingering symptoms of flu, or because I'd eaten the breakfast of an anorexic. The fainting and feelings of weakness will all be worth it though. As Lisa regularly tells me, "Amelie doesn't want fat parents". She'd obviously rather be alone in her obesity. So as of today, Lisa and I are on a joint crusade of weight loss. We're following the Weight Watchers diet, but as luck would have it, we don't actually have to attend any meetings or part with any cash. Lisa's been on Weight Watchers for about twenty years now, so she's got all the gumph, and what she doesn't know about daily points allowances isn't worth knowing. It's only water retention and big bones which are keeping her from size zero. So she's worked out my eating plan, lent me her points calculator, and is offering to weigh me weekly in public. I've declined that offer. I was too ill to go shopping on Saturday, but instead I sat at the computer and ordered the entire Weight Watchers range from Tesco Online. There's now enough low calorie food in the fridge to keep an obese person going for... oooh, about five minutes. But it's going to last me the week. I'll be so thin by Christmas that people will think I'm a Matchmaker. And on the subject of Christmas, I asked my parents for some top-of-the-range rechargeable batteries for my camera last year. They were so expensive that my Mum initially told me they couldn't afford them, but having laid a big guilt-trip on her, she naturally backed down and bought them for me anyway. I received them as a surprise gift on Christmas Day. It was an unforgettable moment. Well I say unforgettable. I discovered yesterday that whilst I was in Newcastle on Friday, Lisa took so many photos of Amelie that she drained my batteries, had no idea they were rechargeable, and chucked them in the bin. So if you're reading this, Mum, can you put them on my Christmas list? You've got twelve weeks to save up. Lisa's advised me to stay in bed today for the good of my health. Well, what she actually said was "I don't want to see your face in here tomorrow", but I think that's what she meant. So I'm typing this on my laptop, propped up by a couple of pillows. To be honest, I'm a bit better today. Yesterday my head was so bad, I was on the verge of phoning NHS Direct for some Tamiflu. Or seeing if my old swipe card would get me into the hospital pharmacy. Today I've downgraded my status to an uncommon cold. 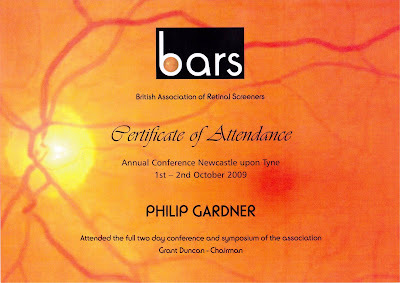 I like the way they've used a retinal photograph as the background for the certificate. It's what you might call an eyecatching design. To be honest, most of Thursday and Friday is a bit of a sleep-deprived blur. I'm not sure whose idea it was to travel more than seven hundred miles and attend a full day's worth of lectures, all in the space of thirty-six hours, but they want their head examined. Preferably with more than a retinal camera. By Thursday evening we were staggering around the hotel like cast members from The Night of the Living Dead. Our journey up to Newcastle on Thursday morning was actually pretty good. If you ignore the fact that I had to get up at 4:30am. The train from Kings Cross was surprisingly empty, and we spent the time discussing important topics such as the bowel movements of a sick colleague, the Brighton branch of the Women's Institute, the joys of knitting, and the staff of the sewing machine shop in North Street, whilst flicking through copies of Vogue and The Lady magazine. Did I mention I was the only man on this trip? Having spotted the Angel of the North from the train window and felt a slight sense of disappointment, we arrived in Newcastle shortly after midday and started looking for Ant and Dec. Or failing that, a taxi. Twenty minutes later, we were at the Falcons Nest. I have to say, it's not quite as it appears on the internet. It is a pub, but it has its own Bates Motel style accommodation block just across the car park. It was actually very nice. And it's next door to a drive-thru McDonalds, which is handy. So we checked in at the bar (two hours before we were meant to), dumped our bags in our rooms (which hadn't yet been cleaned), and headed straight over the roundabout to the Marriott Hotel. Meals were included in our conference package, but unfortunately there's no such thing as a free lunch when you arrive half an hour late. The buffet looked like it had been hit by a plague of locusts, and we were reduced to scavenging the scraps from the rich man's table. Fortunately the deep fried crab cakes had proved particularly unpopular with the other diners, so we ate about six of those each. And followed them up with a buttered croissant and two cream slices. I kept expecting Gloria Hunniford to turn up with a free cholesterol test. But having lined our stomachs with fat, it was eyes down for the British Asociation of Retinal Screeners' Annual Conference. I mean that quite literally. By the time the first speaker took to the stage, we'd been up for nine hours, had very little sleep, and were all ready for an afternoon nap. I could barely keep my eyes open. When we eventually broke for coffee, I loaded up on so much caffeine I was practically sweating Red Bull. I think if I have one criticism of the conference, it's that they didn't provide signing for the deaf. Not that anyone was hard of hearing, but the microphones were turned down so low that we could barely catch a word some people were saying. I was reduced to lip-reading at one point. There was also a frustrating moment when one of the speakers cracked a joke, the front of the hall erupted in laughter, and the back half looked at each other blankly. Next time, I'm booking the front row. But that aside, it was all very interesting. Kind of. I enjoyed the hour for survivors of External Quality Assurance visits (our version of Ofsted inspections), which was a bit like an AA meeting for rock-bottom retinal screeners, although some of the lectures were more dry than a case of AMD. I did learn an interesting way to impress your patients though. Apparently you wait until one of them comes in reeking of cigarette smoke, then you look at their photos thoughtfully and say "Hmmm... I can tell from your retinas that you're a smoker". Apparently it blows them away. Unfortunately I learnt that technique from one of my colleagues over dinner. We didn't really interact with the expert speakers or other screeners, which was a bit of a shame. It's what happens when you're so exhausted you can barely speak. You don't feel like making conversation, never mind new friends. Somehow we made it through dinner, failed to win the table quiz, refused to join in the dancing, and eventually retired to our beds at 11pm. Breakfast on Friday was another buffet affair, which turned out to be quite useful: we all took extra bagels to eat for lunch on the train home. And what a journey home that turned out to be. The conference finished at 1:15pm, and having taken a taxi back to the city centre, passed a café called 'Scrumpy Willow & the Singing Kettle' (that's it on the right, photographed through the fog on the Tyne), looked in a couple of charity shops, and bought a pair of Gucci trousers for £2.75 (which I'm sure can't be fake), we caught the 14:34 train back to London. Fortunately our seats were reserved. If they hadn't been, we'd have stood the whole way. The train was packed full of bad-tempered people fighting over seats, standing in corridors, and complaining to staff. I didn't dare go to the toilet in case I came back to find a tattooed Geordie refusing to vacate my seat. Back in London, things went from bad to worse. I know it was rush hour, but I have never been on such a crowded tube train. Frankly battery farm chickens have more breathing space. I thought I was going to pass out at one point. As did the person who got stuck in the doors, had a panic attack, and had to be rescued by the driver. By the time I got home, I'd lost my voice and found a new meaning for the word headache. I'll be back in the hospital on Monday morning, but possibly as a patient, not a screener. I've come back from Newcastle with a bad case of Tyne flu, so my detailed report on recent advances in the field of optical coherence tomography will have to wait. 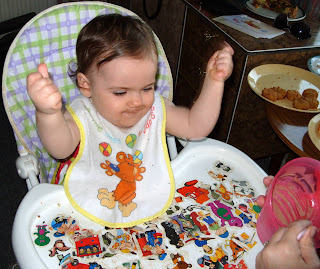 But while I die quietly in the corner of a darkened room, here are a few photos of Amelie on her birthday. Needless to say I'm not in any of them. But in a few years time, when she asks where I was, I'll tell her I was behind the camera. About four hundred miles behind the camera. I'm giving her a bib with a hood, and a pair of rubber gloves.